To do this, go to Reports > VAT Returns. Your VAT return will then be calculated. You can see the VAT you charged to customers and the VAT you were charged from suppliers, with the difference being due to HMRC (box 5). The return also shows the total value of sales and the total value of purchases. You can drill down into the figures of box 1 and 2 by clicking on the magnifying glass icon. If you are happy that the figures are accurate, you can click 'Save & Lock'. This will prevent any transactions included in the VAT return calculation from being edited. This is important as it avoids potential discrepancies. Once your return is locked you will see options to export the return to Excel or PDF. This gives a full breakdown of the VAT return calculation and is useful for checking that everything included is correct. If you find errors you can unlock the return, make corrections and then lock it again. The box 5 figure (amount owed to/from HMRC) will now be in the correct category. When completing your banking, please categorise your VAT payment to the 'VAT Owed to HMRC' category. To learn more about submitting your VAT returns to HMRC click here. 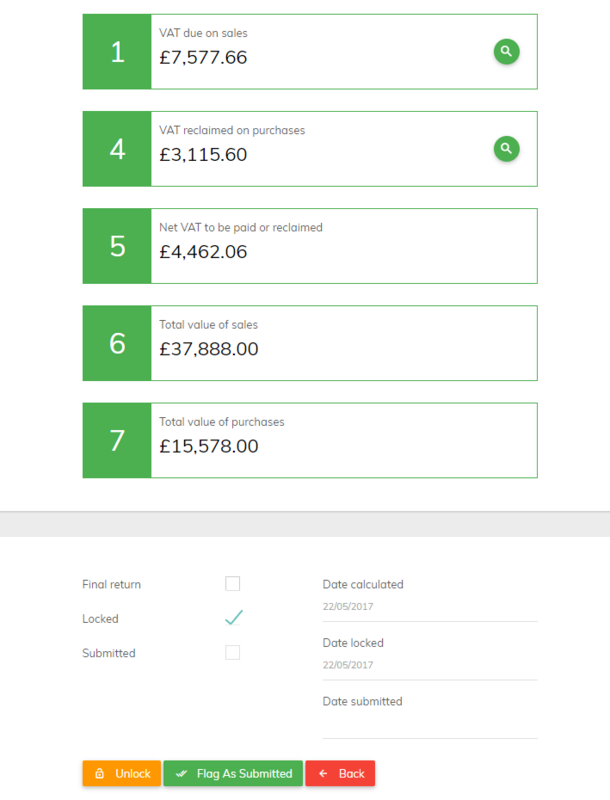 You can view/edit/export all previous VAT returns by going back to Reports > VAT Returns.